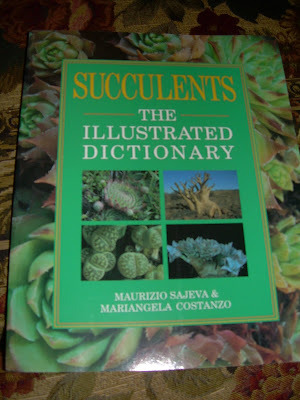 Oh my goodness...I do feel like I am learning so much with my new Succulent book as far as being able to ID a bit more! It is very exciting! Here is what happened with this plant. I took a picture of it out in my tires. 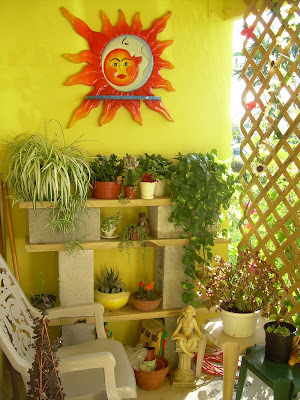 I felt it matched up with Kalanchoe tubiflora, in my book. 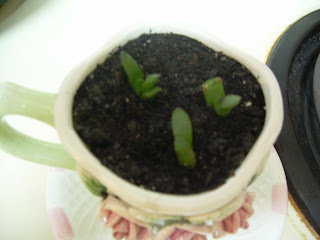 The only thing was that the pic in the book had little adventitious buds on the ends of the leaves......I didn't think my plant had these until I looked at my photo....and lo and behold...they were there!!! Can you see them??? LOL. Funny how you don't sometimes see something till it nearly bites you in the buttocks!!! A bloom come true, and one that still needs to happen! Well...sort of! They still aren't anything to write home about! I am such a big dork...I had seen the "Mother of Thousands" blooms in the wild, but never realized mine were just behind in their bloom time...so now, mine have finally done a little bell magic!!! Up close and personal, it looks like something Cinderella might have planted around her castle! I can't stand how many different succulents it could possibly be. 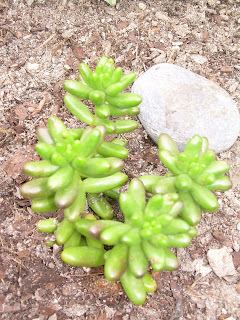 The cutting my sister in law originally gave me was about 6 inches long, and it came from a huge clump of these things that were growing straight up, and also hanging down the side of the planter! 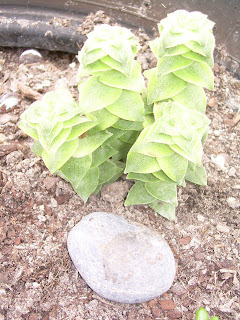 It was very pretty displayed like that...I can't wait to one day see my big, mature, humongous plant!!! It will help to see what color bloom it has as far as I.D. 'ing it goes, for sure! If it is a stapeliad, I think it looks closest to Stapeliad incomparabilis with purple red flowers, and if it is Huernia, I think it looks closest to Huernia aspera with red-brown flowers! I can't wait for a bloom, gosh darn it! That will end the mystery...I hope! 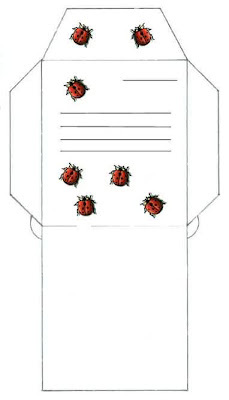 Pretty seed envelopes to print out! 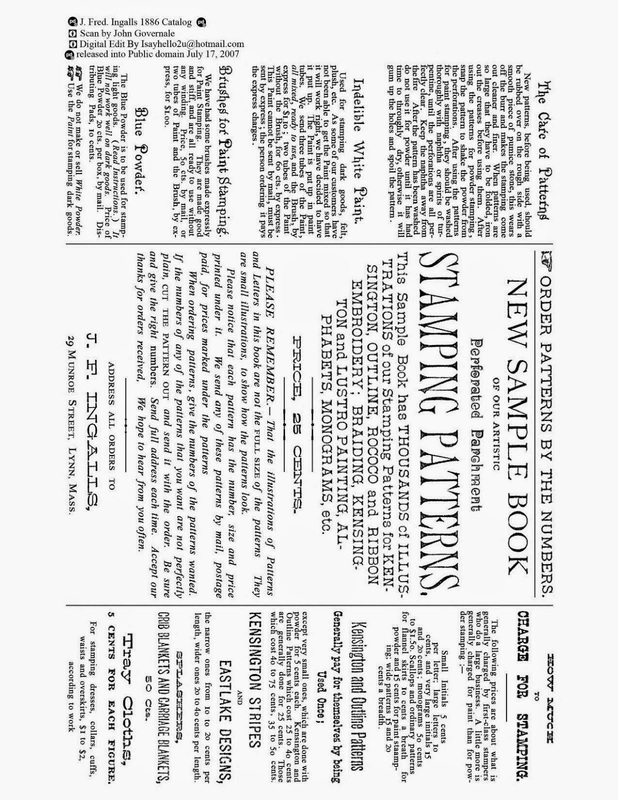 I came across this really cool site that lets you print out seed packet templates on your printer! Check it out at Blossom Swap. This is so great...I am heading back there now for some fun! Well, today is Sunday, and what a lovely relaxing weekend I had! Well, half of it anyway! On Saturday, I was exhausted most of the day...I got up too early, and then was unable to take any kind of nap, due to a chihuahua who would not stop barking! Goodness only knows what had her invigorated all day! She redeemed herself when she slept all night and all the way up to 8:30 this morning!!! I never get to sleep that late. The cat cooperated in this as well...he was still asleep at our feet until that time! WOW! I have felt like a new woman all day today!!! Now I am not sure whether I still love Aiyana or if I really would rather strangle her!!! Ha ha ha...this is already, as Rosemarie calls it, an obsession! I was up at 4am (well, not SPECIFICALLY to make this card), but after being up a while and mopping floors...I went to work on it. I was finished by 6am. 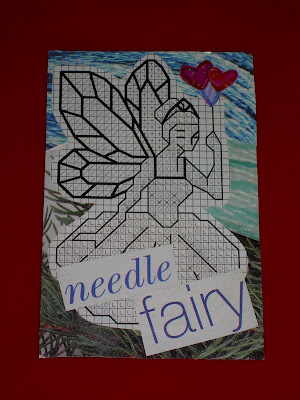 This one started out with the fairy cut out from a magazine, and since she is a pattern you COULD work with needle and thread, I decided she would be a needle fairy...then I came across pine needles...so she is sitting on a nest of them, and for the upper portion of the background I used 2 different pics of blue yarn, and it sort of gives the illusion of air or sky. Then I had a Valentine bit of stickers, and I found these 2 heart balloons to attach to the end of her wand! This one is really odd (and that matches my personality completely)...so I would probably never give her away! She is a character full of love, grace, and happiness...something I wish for us all. A pic for Old Susannah! Here is the photo I had said I would post when asking/or telling about how I was going to use my camping lanterns on the tables for Christmas...I found these wreaths (I bought 2 because for Christmas I had 2 tables set up)...at Target for like 7 bucks each!!! I was so excited because they fit around the lanterns perfectly, and they just "made" the room! The tablecloth has a woodsy feel to it...and we had made a fire in the firepit a few nights while they were all here too, so it really felt "right", and cozy to me! Just wanted to be sure and show you the pic Sue!!! I am leaving it just like this until it gets too hot to use the screenroom, around May or so. I am also leaving up the 2 strands of Christmas lights I hung in a swag style along the outer screenwall of the room...perfect for the whole Florida winter season. Well today was a great Friday at work! As good as it was, I was happy when 5:00 rolled around. We went out to eat at a new restaurant here called Anthony's Coal Fired Pizza. Delish is all I can say! Then I came home and tried my hand at my first ever ATC collage. Mine isn't really mixed media, but more like a decoupage from magazine cutouts!!! LOL. I think it would be fun to incorporate some sewing into it. I have always loved hand sewing, and embellishment, so.....this should be right up my alley! If you want to find out about ATC collages, search Google and also look at IMAGES on Google...it's fun to see all the creative talent out there! 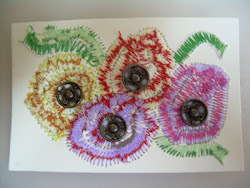 My blogger friend, Aiyana from Water When Dry (see links) told me about this art form. Thanks Aiyana!!! Here is a pic of my first card. It has little tiny triangles of holographic glittery confetty like peices I cut from a strip along the edge of some stickers I had, to make it a little more showy. I think it is very adorable, if I do say so myself. 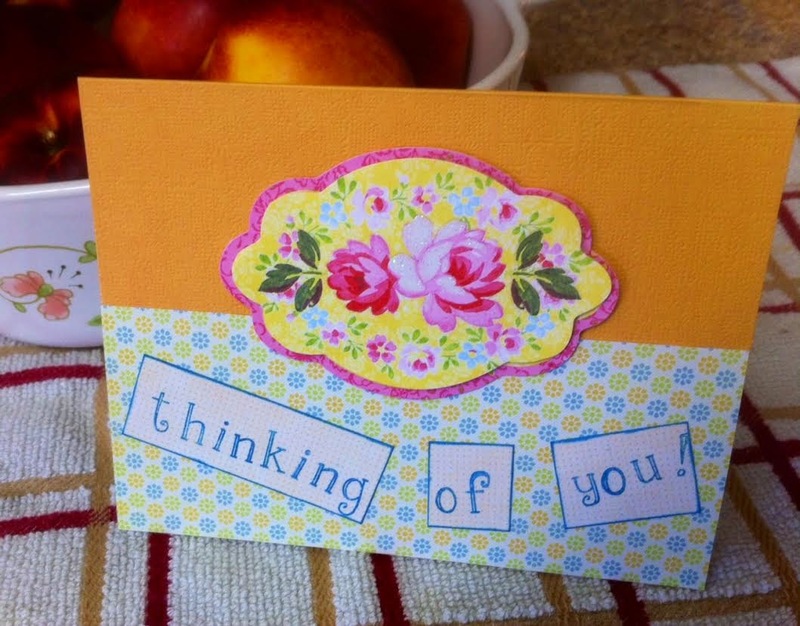 I got my acceptance into a group that does ATC (Artist Trading Cards) on YAHOO tonight! They have groups that make and trade cards! I'm excited. I also got a surprise in the mail tonight...a Succulent book for I.D. 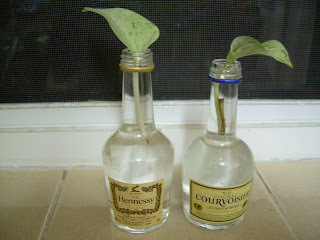 'ing plants! Man there are some gorgeous plants in very unususal places around the world! I need to order more, but I am having trouble with my computer...it thinks I don't have my "cookies" enabled...which I do...so I can't order anywhere that you place something into a "shopping cart" because it has to recognize your cookies to work...I am totally unable to order from either Amazon or Powells Books right now because of this problem! I guess I will have to take my computer to the Geek guys over at Best Buy and see if they can get me fixed up! I have no pesonal interest in this company, I just fell in love with it's name, and the beautiful things it sells! Have you ever bought an object for the sheer simple pleasure that you knew it would provide you? Have you ever known any talented women whose creations are so special that they deserve to be shared with the world? As an artist-featured giftware design and distribution company, The Succulent Wife promotes women artists who wish to convert their creative passions into income-producing enterprises. We bring their products to the marketplace and offer the consumer objects that exude spiritedness and personality. 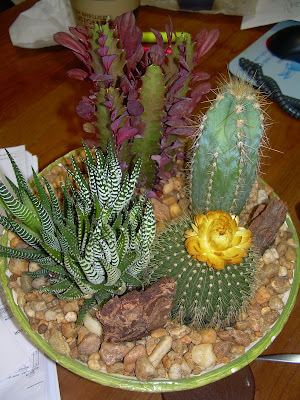 The core concept behind The Succulent Wife Gift Company is to promote these talented and creative women. Our unique approach is to identify and celebrate the creator behind each object. We do that by highlighting them on the Web site and then, by delivering the gift items with a beautifully designed card that describes the artist and her work. And, you ask, why “Succulence”? Oh, Succulence… as in truly tasting life, making it fascinating, exciting, fun, indulgent, even provocative and challenging. But please, never ordinary. We know that we strike a deep and tender nerve in women when we speak of “succulence”. We ALL long for more spiritedness in our lives, as creators and as consumers. This can be achieved through the addition of creativity, uniqueness and playfulness in our daily experience. Our products are designed to appeal to anyone seeking to bring a little – or a lot - of succulence into their lives as every single object is imbued with an attitude of fun, creativity and irreverence. We can only hope that The Succulent Wife’s brand spiritedness will free consumers by allowing them to express their yearning for delectability and excitement through our products. So, please shop through our Web pages. They are full of great gift ideas. We know that you will find that oh-so-perfect gift for “her”, whether she be your mom, wife, best friend, girlfriend or daughter. Oh, and don't forget a little something for yourself! Well, there you are...I love just looking, but who knows I may have to order the Beaded Heart Necklace...for myself!!! A night at the fair! Last night 2 friends and I went to the South Florida Fair. We wanted to go on that night to be able to see Jars Of Clay perform. They are a Christian rock band, and their songs play here quite often on the radio...but it was raining when they started playing, and we had to wait 30 minutes in the drizzle before they finally came out...so we ended up deciding to move along. The admission to see them was included in the fair ticket. I always enjoy the animal area of the fair the most...so we saw all the pregnant, nursing, and all varieties of cows. We saw the horses, etc. I bought a few things too. One was a really neat gadget for my husband. He is a long distance hiker, and many times he goes alone. It has an antler handle, and about a 5 inch length of magnesium, that burns at 5,400 degrees F, when you shave a little off the side...so you can build a fire...even if the thing is wet!!! There is also a length of flint. You can see them here. The other things I found were vegetables at a farmers market they had in the argiculture area. I have seen Sicilian eggplant before, but these were so pretty, I had to buy one for my husband and one for my Mom. The CHOCOLATE peppers I had not seen before, so I HAD to get them each one of these also. The farmer told me it is a special seed which creates the chocolate pepper (in other words, it is not a stage of color that a regular pepper goes through). I took a picture so you can see the brown coloration of it, and also see how pretty this Sicilian eggplant is! The photo really shows off the color!!! The farmer also told me that he believes the chocolate pepper is less sweet than a green, red, yellow, or orange one. I can show you photos of my new plants tomorrow, hopefully. It started to rain harder and harder, and harder...until I finally had to quit and come in. I did get them all planted though...just not in enough time for a photo. 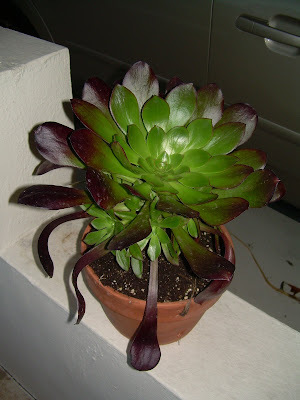 My new Aeonium Catlin Hybrid!!!!! 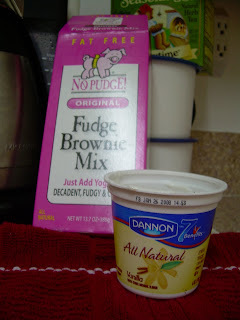 Hey...I had to show you these NO PUDGE brownies! All you do is mix up 1 small carton of yogurt,a tsp. of vanilla, and the brownie mix....bake at 350 for 34 minutes...and voila...perfect brownies...they are very low calorie (110 colories for 1/12th of pan), moist and brownie-ish...yummmmmmmmmm! I transferred my Aptenia cordifolia (Baby Sun Rose)...I.D. 'd by Cindy at Bug Safari (see links) into a thrift store find...a doggy planter with a hole drilled out. Thanks Cindy! He looks very handsome in the corner of my kitchen...but only long enough to take a picture...he goes back out on the front porch for some sunshine during the day. He only came in for the photo shoot. Doesn't he look strikingly like my real-life puppy, LullaBelle (alias Doozy) below??? Last night, my friend Karen, my Mom, and I sat out on screen porch, in the cool summer's night, and made homemade valentines! We had such a nice time...it was a lot of fun...many of the supplies we already owned...just took a trip to the craft store for a few embellishments...anyway, I think they all turned out great...here is a sampling of a few of mine. My husband made us grilled talapia, fingerling potatos and asperagus, which we ate with a lovely glass of different wines left over from Christmas!!! A night to remember, for sure! Well, right after I finished telling Rosemarie (see my links) that I don't usually bother to mess with posting my photos LEFT of RIGHT, here I am doing it! 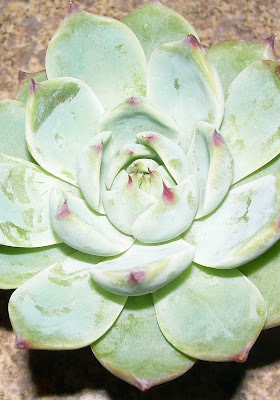 I took these pictures yesterday...the bright sun of winter is really bringing out the color in a few of my succulents...as you can see my last post of Flippin Flapjacks is so RED! It is not usually like this in summer...but then again I have only had it through one summer, and maybe it has needed all this time to develope it's dark shade. 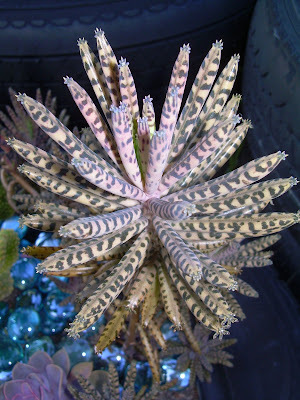 Same for this beauty above, which I used to think was a kalanchoe of sorts, but now I am thinking is a crassula! Ha ha ha...do I know names, of what??? It is not my forte, obviously! I keep putting off buying books to use for identification thinking my obsession will not last. For those of you who have been reading my blog (or blogs) a while, you know how fickle I can be! I think I will go to Water When Dry's blog (see links), and order some books through her Amazon link right now! -lyrics to the chorus of Superchick song, "We Live"
Well, trying to get a good shot at these aloe blooms is like trying to catch lightning in a bottle! The color is very pretty...a salmony shade. You can see the color in the top photo taken from above, and then a side view below. My grass is going to the birds! We have been under tight watering restrictions for about a year now, and it got difficult to water due to the times allowed...(4am-8am, for example)...and my pump sits right outside my daughters bedroom,and it is loud enough to wake her, so I chose not to water at all, except to get what Mother Nature provided. We are supposed to have a rainy week coming up...seems like the good Lord provides just in time to keep my yard from TOTAL destruction! 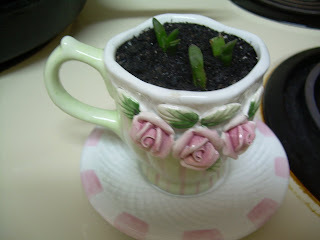 My little teacup has served as home for now 3 seperate plantings...today I redistributed what was in there, and put in 3 little babies, who are saying "I wonder what we will be when we grow up"??? I also recieved some cuttings and a few rooted peices of this variegated pothos (Epipremnum aureum 'Marble Queen')...they are common household plants, but I have never seen one with this coloration before...mostly a near white, with speckling of green...very pretty!!! I believe this plant in all of it's varieties could become an obsession of mine! I have a solid green one outside on my porch right now...it needs friends...or should I say "cousins"! 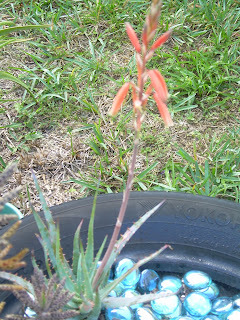 I plan to take individual photos of my plants and post them, and I have a few things happening suddenly, in the succulent tires ...like a blooming aloe, that you must see....probably tomorrow morning!